The new vogue in clothes will be best portrayed in our Spring and Summer showing. Some of the features will be shorter vest and no vest, no flare locks. 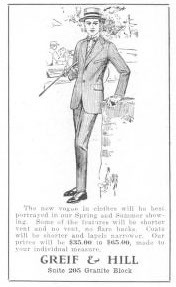 Coats will be shorter and lapels narrower. Our prices will be $35.00 to $65.00, made to your customization.